Aoi and Hinata are childhood friends. Aoi prefers staying indoors and is afraid of heights, whereas Hinata is outgoing and loves mountaineering. They both decide to climb a mountain in order to see a sunrise they saw together when they were younger. In the coming third season, they enjoy hiking beautiful mountains with colored leaves and the story gets even more colorful when they become friends with local school girls!! We had to wait 4 years for a third season of Yama no Susume and the big question is of course if the series is still as good as the previous seasons and if it still has the same charm? The story in the third season focuses mostly on the relationship between Hinata and Aoi which was already the case in the previous seasons too and one of my favorite aspects of the anime. Something that has less presence in this season is actual mountain climbing because they focus more on the slice of life elements and they even dedicate whole episodes to it which isn't directly bad because we get nice character developments through it in this season especially between Aoi and Hinata. One of the things I always liked in Yama no Susume were the background arts and I have to say that the third season sadly doesn't look as good as the previous seasons and especially the characters look in some episodes really minimalistic drawn and even kinda low quality at some points. The Art in S3 is the weakest part of the anime, but even if I say that the anime still looks better than most other Anime this season so it's not such a big thing it's just sad that it isn't as good as in the other seasons. There are some openings that always give me a smile and which I just don't want to skip and the opening of Yama no Susume S3 is one of them it's a perfect way to get into the episode. The episode themselves have the same OST as we already got in previous season and it's of course still fitting. The ending is pretty nice, but I like the opening more. Like I already mentioned earlier this season focuses mostly on Aoi and Hinata and gives them trough multiple episodes really good character development, but what about the other characters? We get to see the other characters and they all get their moments to shine which I really liked because one thing I was scared of at the start of the season was that they won't give the other characters their moments because it first seemed like they will only give Aoi and Hinata moments and forget about the others. I really enjoyed this season of Yama no Susume and even though the anime has a loss in quality compared with the previous seasons it gives me still the same feeling I got from the previous seasons and it's a comfortable watch, but one can clearly tell that this season is mostly fanservice for people that wanted to see the characters one more time animated. Overall the Anime is a 9/10 for me and I can recommend it to everyone who likes the previous seasons. The claim that sequels are always better than prequels is true, because YNS S3 is better than S2. It's more relatable for me as each and every episode reminds me of the friendship I have with my best friend, the fun we have together, the jealousy and frustration that we have sometimes when we can't seem to find time to hang out with each other, and the problems we face which we share to each other. And YNS S3, it's just that. Less hiking on Yamas and more emphasis on personal relationships. Between Aoi and Hinata(of course cos they're the MCs) and between their friends. So w/o further ado, leggo start the ofc review! P.S. This is gonna be quite a personal review so yea. Story: Well I already gave a short summary of what YNS S3 is about. Sure there's episodes where they go hiking together, but 80% of the anime focuses on the deep friendship which Aoi and Hinata have with each other. What really attached me to this season of YNS is what I said earlier, the fun times and problems which Aoi and Hinata faced. It was extremely relatable towards the ending when both Aoi and Hinata seemed to just missed each other every time they wanna hang out with each other. Quite a mirror to my real life right now, with my friends in NS or are too busy, especially my best friend. Now that I look back at time, I do miss the times when me and my best friend could hang out with each other everyday after school, 4 years ago. So I can totally understand Hinata's feelings. That feeling of not being able to hang out with your best friend. I also like the fact that the anime tries to involve Honoka more in this season. And we could definitively see Honoka hanging out with ze gang(Aoi, Hinata, Kokona and Kaede) more this season. Granted, this season may not have been the most relaxing one due to the fact that it focuses on relationships more, but it was a very relatable season, at least for me. Animation: Kindof a hit and miss for this category. I like the fact that the producers try to make the scenery as realistic as possible, but when it comes to the faces, wow, I didn't like the way the animated some of the scenes. Felt cheap. At the same time of course the facial expressions were priceless most of the time. Music/Sound: As usual using the VAs to sing both the opening and endings song, me like. The soundtrack just makes me relax whenever it plays(and makes me think of going to Japan :v). Characters: For this review I don't have much to say about the characters, because we already know their personalities and character from past season. So for this section I just want to focus on Aoi and mostly Hinata. So as we know in past seasons, Aoi is kind and friendly, but she's also.... kinda.... idk she worries too much. During the last episode when she wanted to get a present for Hinata she just overthought what she was gonna get. Oh and add to that her constant thoughts of Hinata making fun of her..., yes that's very funny xD. As for Hinata, this is the first time we see her being a little bit insecure about her friendship with Aoi which i can't blame her for that since she and Aoi seemed to be always missing out on each other for a few episodes. Ah yes her stubbornness is also a trait of her that is funny but also can be rather annoying. So.... I guess that's it for characters? Overall, this has gotta be my most relatable anime this season, because it reminds me so much of the relationship I have with my best friend and it is these kindof animes which I really love. I really do hope that they'll make an S4 because we havent seen Aoi conquer Mount Fuji yet. Yama no Susume: Season 3 continues the story and aesthetics of the previous two seasons, following Aoi Yukimura, Hinata Kuraue, and their friends as they go hiking and enjoy life together. It does not manage to reach the heights of the supremely well-done Season Two, but still manages to be an enjoyable slice-of-life. Story and Character (7/10): The story is largely episodic and follows a similar structure to previous seasons, but has a rather different tone and focus. While Seasons 1 and 2 focused largely on hiking with some minor character development on the side, Season 3 switches these and focuses more on character interactions. Some episodes involve Aoi overcoming personal struggles, while many others reveal how she and Hinata question their friendship and worry about what they think of each other. These events do provide some interesting developments and are occasionally heartwarming, but the drama can get irritating at times and the relative lack of hiking compared to S1 and S2 was disappointing. I would have liked to see a better balance between these elements, as was found in Season Two. Without spoiling anything, it is worth noting that the story does not fully conclude at the end, instead leaving itself open for future seasons. This is unfortunate, but considering the show’s length, it is not unexpected. The cast of supporting characters was serviceable but mostly pushed to the side. Kokona and Kaede both return relatively unchanged, but Kokona did not make any major contributions to the story and Kaede in particular was notably absent for a large majority of the series. However, Honoka (who was introduced in Season Two) did have a good presence in several episodes. Art and Sound (7/10): There isn’t much to discuss here. Backgrounds and scenery are still very pretty and well-drawn, but character design is much simpler than in previous seasons. Faces are sometimes only illustrated with simple lines and dots from a distance, which is noticeably low-quality. The soundtrack isn’t very memorable aside from the opening and closing, which are both catchy and a pleasure to listen to. I especially liked “Chiheisen Stride”, the opening. Overall (7): Yama no Susume: Season 3 was an enjoyable but decidedly different series when compared to the seasons before it. Its relative lack of climbing, unfinished story, and inclusion of drama make it a weaker overall piece, but for those who enjoyed previous seasons, it is still worth a watch. Yama no Susume's 3rd Season is here and LA can't be any more satisfied with this series getting another season. Yama no Susume's 3rd Season picks off right where the 2nd Season left off, with it being Winter for Aoi and the gang, any chance for them to try and climb becomes out of the question, thus Aoi and the gang continues to climb by climbing other mountains with their friends with some growing conflict between Aoi and Hinata along the way. See in this season, Aoi and Hinata are separated the most, be it through schedule conflicts, misunderstandings as well as Aoi opening up and gaining new friends while Hinata gets more isolated due to her conflicting schedules with Aoi, now this is something of a focal point that comes into play but it gets dealt with and resolved rather well and both Aoi and Hinata reconcile, but the entire drama between Aoi and Hinata isn't spiteful in anyways more like misunderstandings and assumptions that lead to what it became, as both Aoi and Hinata are developing their relationship but apart and this tribulation grows their relationship even more. 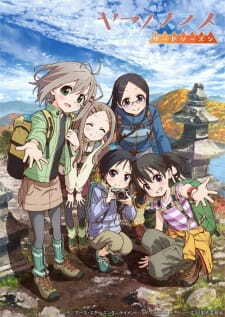 Nevertheless, Yama no Susume's 3rd Season still looks at mountaineering in the typical Yama no Susume flavours of giving us tidbits about mountaineering and the such from equipment to finding new Japanese mountains to climb but really the "drama" concerning Aoi and Hinata helped with this season as both first and second season was essentially a slice of life comedy with mountain climbing, the 3rd Season brought something new to the table and dealt with it rather well. Now since Aoi and Hinata are the focal point of this season, what about the rest of the cast?, well Kokona tags along with Aoi as she's probably the most freely open character this season and she probably has the most screentime outside of Aoi and Hinata. Honoka Kurosaki voiced by Nao Touyama also gets this, at first being a character introduced in the second season and befriends Aoi, she goes along with Aoi in several trips to mountains in the process. The only character within the main cast who got shafted in this season was Kaede Saitou voiced by Yoko Hikasa as Kaede has exams thus is trapped in an endless cycle of studying and little mountain climbing thus her lessen screentime though she appears with Hinata more often than not, which is shame as LA wanted to see more of Kaede. With this you can kinda see the entire "Aoi and Hinata separation" through the rest of the cast and the major conflict of the entire third season's buildup. Voice work, well the entire cast is back and with Honoka getting more screentime, means Nao Touyama gets more too, BUT LA won't get LA's bias come into play...MVP's goes to Yuka Iguchi as Aoi and Kana Asumi as Hinata, it's a no brainer here. Yama no Susume's 3rd Season gives us something new in terms of character development from Aoi and HInata, Aoi as she becomes much more open through mountain climbing, Hinata as becomes more isolated and away from Aoi giving Hinata internal problems concerning their relationship and by all means, as a result they grows their relaitonship even more oddly enough. Yama no Susume's 3rd Season is about mountain climbing, but this season shows that it's much more than that and as cheesy as LA will say it but this fits into Aoi and Hinata's relationship this season and Yama no Susume as a whole and that is of the tried and true "the power of friendship" and Yama no Susume's 3rd Season encapsulates it in variety of spectrum all under the hobby of mountain climbing.